Whenever Fortress Cyclops attacks, it gets +3/+0 until end of turn. Whenever Fortress Cyclops blocks it gets +0/+3 until end of turn. Fortress Cyclops makes for a fantastic beater and blocker when targeted by Aurelia, Exemplar of Justice's ability. It's also a favor include with the Boros watermark. Very solid deck. I see some non-optimal choices but I presume its due to budget or flavour, like Fortress Cyclops. I do think that Skullclamp does not pull its weight in this kind of deck as you only have one token producer as far as I can see (that being Assemble the Legion). Maybe swap it out for Scroll Rack since you already have Land Tax? Or maybe even Sensei's Divining Top. I don't think Loreseeker's Stone is worth it tbh. I'd rather have The Immortal Sun or even Staff of Nin. I'm having a difficult time trying to explain why I dislike those abilities, and I think it's because its ability gives no real options on when to use it: after attacking, before damage is dealt is the correct time to activate it, and the only time you don't want to activate it, is if the opponent has an even larger flying threat. It would be an interesting choice as a creature that gets weaker when attacking, but the "untap this" ability is better than vigilance: even Cryptic Command doesn't stop it from being a 5/5 flying lifelinking blocker. Other cards that depend on whether it's tapped or untapped, are usually like Castle Raptors, Hollow Dogs, Fortress Cyclops or Sphinx Sovereign. It's rare to get an increase in power for blocking, or to get an increase in defense for attacking. The only example I have of a "tapped matters" that comes with a built-in untap ability is Sword of the Paruns, which gives different bonuses based on whether its tapped or untapped. That bat card only has a bonus for being untapped, so there's never a choice to be made. To fix that card, the first step is to get rid of that self-untap ability. Fortress Cyclops could potentially do well. 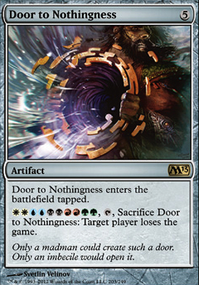 White has access to multiple cards that grant protection, allowing it to swing unblocked and protect it from removal. It will be coming down a bit later in the game but you can prepare with rocks, equips, blockers, and red boardwipes to eliminate weenies that dropped on the first few turns. You will need to hit an opponent a minimum of three times to kill them (assuming you don't have any buffs) which means you are dangerous but not a pressing issue. I think the main issue with this commander is how you will deal with the entire table. This can be shored up with some mutual damage cards like Hissing Iguanar and battle tricks but overall I think it will lack the legs to pull out a win a majority of the time. Belligerent Hatchling comes out as a 2/2, making it vulnerable to half of the board wipes in the format. Removing the counters will require at least 4 mana and 4 cards, which means you will need a hand with at least 4 cards to be able to use it effectively. Not only this, but if your commander is removed you will need 4 more cards to get it back to fighting shape. I think this commander has too many stipulations to be able to be used effectively every game but a 6/6 for 4 mana is definitely nothing to sneeze it. 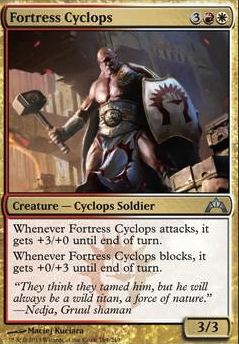 Would Fortress Cyclops be a potential candidate for the Boros list? What about Belligerent Hatchling ? In your deck who said this would be fair? I noticed that you're running Breya at the helm. Breya wants to combo out and I'm not seeing any way of doing so in your list. You've some obvious combo pieces such as Rings of Brighthearth but I am not seeing Basalt Monolith which when paired with the Rings makes infinite colorless mana. Nor am I seeing fun things like Grand Architect and Pili-Pala for infinite colored mana. Take a look at my deck Combo Number 5! for some examples of combo pieces to consider with Breya. As for your deck !Blade to Hire!, Boros is a hard color to play in EDH based upon the experience of my play group. You need at least three more lands because of the lack of ramp. In terms of lands I would recommend adding Rugged Prairie, Sacred Foundry, and Hall of the Bandit Lord. You could go a little further and cut a mountain for a Flamekin Village as well. Haste is your friend after all. I'd cut Crusader of Odric, Fortress Cyclops, and Duergar Mine-Captain for the lands as they seem kind of underwhelming. Next I would cut a few of the token makers for some spells that grant you extra combat phases such as Seize the Day and perhaps some items like Savage Beating that make your low power and toughness creatures pack more of a punch (also think about having Gisela, Blade of Goldnight on the field and casting Savage Beating entwined picture it and the expressions on the faces of your playgroup...now that you've got that image in your head cut Deploy to the Front for Savage Beating). Other cuts that could be made are Opportunist and Goblin Legionnaire if you want to keep some of the token makers, however, you likely should cut them for more board wipes anyway. They have too high mana costs, and most aren't worth it (Actually, none of them are worth it, in my opinion). If you are going to spend 5, 6, or 7 mana, it needs to guarantee you a victory. None of these do. Frontline Medic makes everyone invincible, Legion's Initiative buffs them and protects them from removal. Boros Elite and Boros Recruit give you some early board state and can be useful later. Ash Zealot gives you some graveyard hate and has first strike and haste, which is awesome. 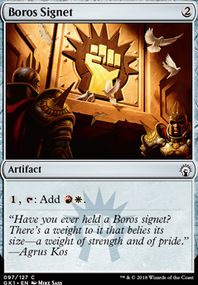 Should sideboard Wear / Tear, and make sure you have 4 Boros Reckoner. They are so good. 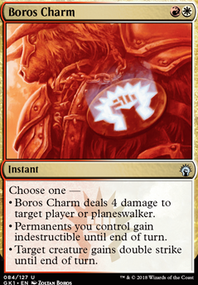 Also, you should not sideboard Boros Charm because it is so good and so versatile. Should mainboard 4 of those. I'm not a big fan of Ordruun Veteran or Holy Mantle How have they worked out for you? Also, Gisela, Blade of Goldnight is a great card, and I would definitely recommend Dictate of the Twin Gods. If you make Boros Reckoner indestructible with Boros Charm or Frontline Medic, then you can use him for an infinite damage combo with Dictate of the Twin Gods. 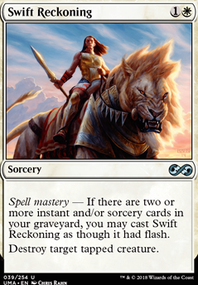 Even if you don't pull that off, your creature are still dealing double damage, and Boros Charm becomes a 2 mana, 8 damage, making it particularly easy to finish off opponents. Because it has flash, you can use it during combat or save some mana to use it at the end of your opponent's turn, after their combat but right before your turn begins. It has won me so many games. Arashin Foremost: No dispara nunca, hay muy pocos guerreros en el mazo, y los estoy sacando todos porque son horribles. Yo tengo un mazo de 60 Tribal de Warriors, dps te lo muestro para que veas la diferencia. Lantern Scout: No sirve de nada ganar vidas. No vas a ganar un partido curandote.